What happens when we decide to get together with some friends on a lovely piece of land, and build family and community together, and after a few months or years the rosy glow of our idealism wears off and it seems to become so much more difficult than we imagined? Why do we find ourselves arguing, feeling jealous, greedy, and uncooperative? It seems that if the others would just do it our way, and stop being so unreasonable, things would work out great! How do we communicate what we want without being controlling? How do we stay connected when our needs seem to be conflicting with others? How do we truly share power and not be co-dependently giving in to please another? What do we do when we feel like punching the other person, or we seriously consider whether there might be some way to never speak to them again? How do we handle our attraction to someone else’s lover? Why do we find ourselves willing to back off and give up on what is important to us, just to avoid conflict? I have noticed that emotional problems between people are the main reason for breaking up relationships, businesses, and communities. Part of permaculture is making a human culture which is healthy and sustainable, just like creating a healthy balanced culture with plants and animals on a farm. Because our Western culture is so emotionally repressed, most people have no models for how to handle their own emotions in a responsible and healthy way. We go through life hoping for peace and pleasure, and if we get triggered or have our “buttons pushed,” we tend to blow up out of control, and then try to get out of the unpleasant emotions as fast as possible, without really understanding where they came from or why they are so intense. Most people have trouble even keeping a healthy relationship going with one person, so the idea of living with a whole group is overwhelming. Other people are like mirrors, and sometimes they reflect parts of us we don’t really want to see. If one mirror is too much, then what about fiveor 10? There is nowhere to hide then! Each relationship adds levels of interconnected complexity. A number of my friends look at my busy, complicated situation from their quiet, sedate lives and wonder why I am even interested in such a challenge. A community is an emotionally intensive experience. It is also a fantastic way to grow, if you are committed to your own healing and are willing to look carefully and fearlessly into your own shadows. The shadow is any part of the psyche that is unpopular and judged as undesirable. It exists because of an accumulation of past hurtful experiences. We can see our own shadows in the places where we find ourselves doing things that we have already decided we do not want to do, such as indulging in addictions. It is also seen in chronic illnesses that we can’t seem to heal—or where we feel blocked in moving forward toward the things we want to create in our lives. Shadows live in our unconscious, so by their nature they are hard to see. It is far easier to notice something you do not like about another person, thus projecting your shadow onto them. There is also a well-known tendency for any group to pick a scapegoat, or “identified problem person,” who manifests the shadow energy of the group mind. The problem with shadows is that no matter what attempts are made to control or ignore them, they keep popping their ugly little heads up in the most inopportune and embarrassing moments. This is because they want healing, and they want to be honored and acknowledged. The longer they are pushed away and repressed, the more energy they build up until they really seem like monsters lurking somewhere under the thin veneer of our “nice” conscious personalities. When I was around 25 years old I joined a small intentional community that was egalitarian in structure and involved income sharing. They were six adults and a baby living in a large house in a small town, living communally in a very intense way. Income sharing is challenging for many people, because it involves pooling the income made by the various members, and then using it for all the group expenses and giving each member a small stipend for personal use. This required a lot of bookkeeping and a lot of emotional processing to be sure that everyone felt that the resources were being dealt with fairly. In addition, living, working, and eating in one house created an emotional pressure cooker from all the intimacy. I loved it. And I also noticed where it was not working well. The members had various levels of emotional skillfulness and awareness. I became aware of a pattern in which someone who was emotionally upset, and not taking responsibility for their feelings, would use the group meetings to process all their emotional problems. There would be a lot of projections onto others, and a tendency to have the group attention focused on the upset person for long periods of time. This was very draining and time-consuming for the group, and eventually led the group to dissolve. This experience led me to seek ways that people could live together in harmony, and work out emotional difficulties. The good news is that shadows and old emotional distresses can be cleared and permanently resolved, with loving help from others. I studied and practiced many different group processes and therapies, and the two I have found most useful for community are Nonviolent Communication, or NVC, and peer counseling, also known as co-counseling. We use NVC when we need to communicate something and listen well to others, and use co-counseling when we want to explore inside and deeply feel and release emotions. They complement each other well. 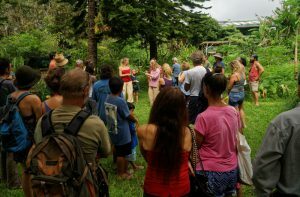 In La’akea Permaculture Community, we train people in both skills in our internships, and use them as a basis for having common language and agreements about how we choose to relate to each other. Co-counseling is a worldwide network of non-professional counselors, who trade sessions for the purpose of clearing emotions, dissolving rigid patterns of behavior, and recovering our ability to be present and think clearly and rationally. It is a people’s liberation movement that started in the ’50s, has spread all over the world, and has many permutations and offshoots. You can check out the original organization at www.rc.org, where you will find all the basic ideas and many resources for learning the skills. Emotions are natural waves of energy that arise in response to a stimulus, and if they are allowed to flow and are not repressed, they naturally resolve themselves. It is natural for a child to get angry if another child steals a toy, or if they are denied a food that they really want. The emotion can be validated and allowed space to be felt, and yet not be the deciding factor in how the situation is resolved. Hurtful things happen to us as a natural part of life, and our emotional responses to them are our natural way of healing the hurts. A child who is sad about not having another cookie can be allowed to cry, and have the feeling acknowledged in a respectful way. They can be given empathy, but not another cookie, and soon the tears will wash through and the inner sun with shine again. In our lives, in this culture, we experience many disappointments and moments of neglect, abuse, and not having our needs met. If we are not given loving empathetic attention around the emotions stirred by these hurts, they tend to get stored in our subconscious shadows. There they wait, and when anything later happens which is similar enough to the original hurts, we experience that unpleasant phenomenon known as being triggered, or having our buttons pushed. Then we find ourselves re-experiencing the old feelings, saying and doing things that don’t work well, and generally being unable to stay present and think clearly in the moment. If we can recognize that we are triggered, and ask for help from our friends, we can move through the pain into clarity by allowing space to deeply feel the emotions. We often need and deserve support from others in working with these old pains. The most useful kind of support is calm, loving presence and empathy from another person. We avoid giving them advice to solve their problems, and trust that when the emotions have washed through, they will be able to think again and work out their own best solutions. It takes training and practice and personal inner work to offer this to each other, and it is well worth the time invested. We hold space for people to talk, cry, laugh, rage, and tremble out fears. Emotions are messy, physical things that involve lots of movement, sounds, inner chemistry, and body fluids. When releasing anger, a few moments of really beating up a pillow are often more effective than hours of verbal processing. Laughing and shaking the whole body are really useful when people feel scared and nervous. Crying helps us let go and heal from a loss. Emotional releases are deeply healing when they are welcomed, held in a safe space where no one is hurt, and allowed to finish. How do we use this in community? Mostly it is coming to a group agreement that emotions are important, and we can feel them fully and then make our choices based on our clear thinking. We make room for the shadows to come forward in a safe way, at the right time, by invitation. This prevents them from having to burst forth in dramatic desperation just to get any attention. Specifically, we have opportunities at our weekly Heartsharing meeting to express our deeper feelings. We ask every week at these meetings if someone has something to clear with another person, and hold space for that to happen with group support. We do morning check-ins every day where we are open to shorter sharing about anything that is coming up for people. We do group processes like the Forum, where the whole group gives attention to one person at a time as they freely move and express whatever is alive for them in the moment. We play theater and psychodrama games so that we can laugh and be creative together. We take time to trade sessions in pairs on a regular basis, so that our needs for personal attention and emotional expression are met. We hold space for each other while we struggle through the hard places. When someone has a sudden injury or emergency, we take time to allow the feelings, scream, or yells to come through, so that the energy does not stay stuck in the body and healing can happen fast. When two people are in conflict, we can give each a time individually to blow off steam and explore what in their past is getting triggered. Then we can meet together in a mediation session and work out solutions. We help the children work through their feelings using NVC, Connection Parenting, and counseling. We have small support groups on specific topics, such as parents getting together to talk about childraising challenges, or the older women having a meeting to listen to each other. When everyone feels safe to be truly authentic, and express whatever is real for them, no matter how ugly or uncomfortable it seems, then the hurts that have been relegated to the shadows are able to be brought into the light of awareness. They can be explored, understood, and released. We can look for the old roots of what happened in the past, and re-program the old habits into new, more healthy patterns. We can truly come into a place of closeness, trust, and safety in relationship with each other. This is where community can be a path of both personal growth and spiritual awakening. To fearlessly face one’s deepest pains, with the loving help of others, creates a situation where we can go much farther and faster together than we could go alone. We can free each other from old chains and cages, with patience and compassion. This is why I love community. As we each become free of old fears and blocks, and open into our own unique, beautiful power, we can more effectively create a new and healthier world. Amara taught Re-evaluation Co-counseling, a method of peer counseling, for over five years, and has been studying and practicing it since 1983. She developed her own approach to peer counseling in 1988, called Wholistic Peer Support, integrating many ideas from RC with spiritual meditation practices, psychic healing, and body-centered techniques. She is a member of La’akea Permaculture Community, near Pahoa, Hawaii. Announcing Video Classes in Co-Counseling! If you have never been able to attend a class in peer counseling, or you would like to brush up on the skills you already have, here is your chance for easy, low cost training in your home! Class #1: Introduction to Wholistic Peer Support Counseling- How emotions and thinking effect each other, giving good attention, how emotions get stored and can be released and permanently healed. This class has two lectures of 25 minutes each, parts A and B. Class #2: How to Begin as a Counselor – When you are with someone who is upset and you want to give them the best support possible, what are the most effective things to do? And what does not work? Watch humorous demonstrations of students learning these techniques. These are applicable with friends, family and children, as well as paid clients. This class is 35 minutes. or buy the whole series on DVD for $25 postage paid. 2013 Local Food Contest Entries- Volcanic Sweet Potatoes! Winter Internship and Permaculture course were amazing!